The colors were hard to see in picture but I am happy with it. I like the alternating jute and fabric. I hope it cleans well. Safavieh's Cape Cod collection is inspired by timeless contemporary designs crafted with the softest jute available. This rug is crafted using a hand woven construction with a jute pile and features main accent color of natural. Think coastal living and casual beach house style with rugs so classic they'll even work in the city. Dimensions 2 ft. 3 in. x 6 ft. I was looking for something a bit different for a sunny hallway. I bought two of these rugs in 6' x 2'3" size, then sewed them together to get a 12' runner. 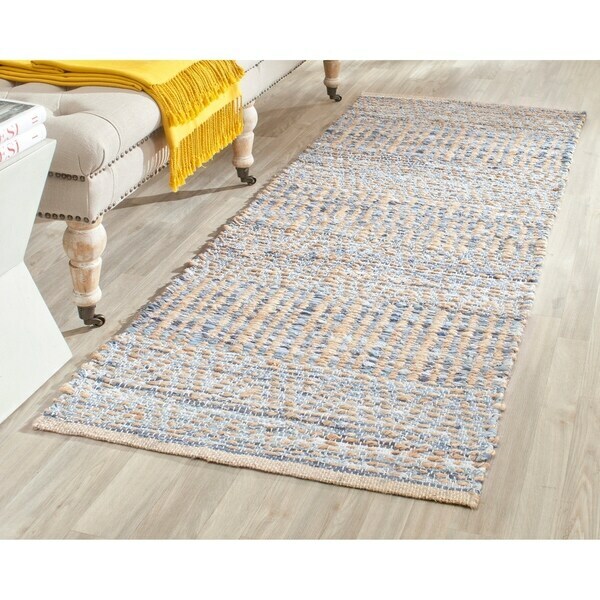 It's an interesting design, very beachy and the blue color comes from the use of denim material so I don't expect the rug to fade as another natural fiber jute rug did. I bought this rug for a spot in one of my bathrooms. The area I intended it for will only accomandate a 6' 2" rug, so thought i'd be ok with a 6' rug. This rug states it is 6' long but in actuality, the one I received is 6'4", which is too long for my space. Dissapointed. Love this rug! 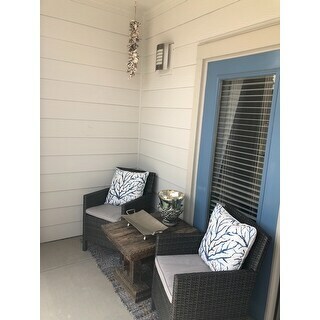 I used it on my small apartment patio, and it is the perfect touch. The fabric woven into the grassy material almost has a denim look to it. I definitely think it will hold up. This rug is really well made. It fits my space very well and I love the color and feel. It is not overly soft, but I like the more rustic look. Highly recommend. I enjoy the color and texture of the rug. Do not vacuume only shake it out. Great color! It's a beautiful blue, not green or turquoise but a true denim and light blue. And mixed with the natural jute it's just right. Have it in front of my double vanity sinks from Restoration Hardware. Fabulous find. It is a beautiful piece that is the right amount of highlight for the entry way. I love the tone of blue and jute. It isn't overwhelming nor too generic. It has some extra fabric sticking out of the knots but that is fine. I like the handmade feel. It came pretty quick after I ordered. I wish it had some base layer to keep it in place. Colors are perfect...a neutral blend w shades of blue. Looks great in my beach house! Really looks perfect in guest bedroom in front of closet. Coastal decor. Color & size seem to be what I'm looking for. It is for my guest bathroom.